"This roasted potato side dish, made with less olive oil and more fresh herbs than the original recipe, is a healthy hit with everyone." Roast in preheated oven, turning occasionally, until potatoes are brown on all sides, 20 to 30 minutes. 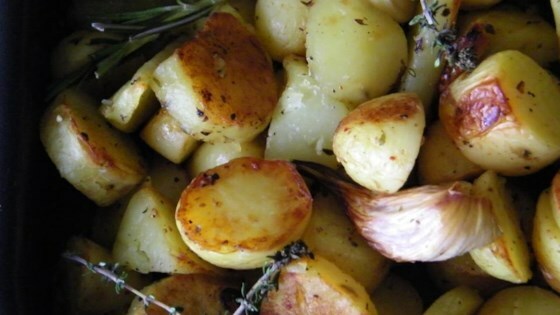 Roasted potatoes with less oil and lots of fresh herbs. This recipe is a healthier version of Oven Roasted Potatoes. This is very similar to a recipe that I use, with the addition of basil. I know it will be delish! And don't take my word for it, my picky son just loved these potatoes!